Background: The management of patients with liver metastases presents a challenging problem in clinical oncology. Patients with limited involvement of the liver may be suitable for surgical resection or local ablative techniques. Stereotactic body radiotherapy (SBRT) presents an emerging new technology that has shown high efficacy in ablating tumors at various disease sites. Methods: A comprehensive literature search was performed to identify articles in regard to the SBRT in the treatment of patients with liver metastases. Results: SBRT allows for the delivery of high-dose radiation in few fractions to the tumor with extreme accuracy, while minimizing the damage to normal surrounding tissue. 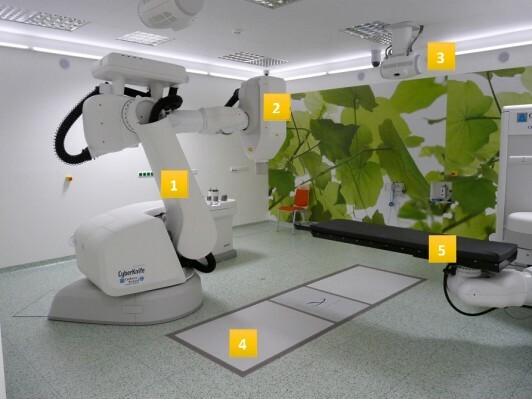 The CyberKnife® system is an image-guided robotic system that delivers SBRT, tracks tumors during respiration, and automatically adjusts treatment for any patient movement. The most frequently used indications for CyberKnife® therapy are ≤5 liver metastases with maximum tumor sizes of 6 cm, no extrahepatic disease, good performance status, and adequate hepatic functions. Local control rates range from 70%–100% at 1 year and from 60%–90% at 2 years. Severe toxicity related to SBRT is uncommon – grade three side effects occur in less than 5% of cases. Despite excellent local control rates, out-of-field metastatic progression (out-of-field hepatic metastases and extrahepatic metastases) develops in a substantial proportion of patients after SBRT. Therefore, it seems essential to improve the selection of patients with liver metastases for SBRT. Conclusion: The CyberKnife® system presents an effective minimally invasive treatment modality for patients with hepatic oligometastases who are not suitable candidates for radical liver resection. The available data suggest that liver metastases can be treated by CyberKnife therapy with very low toxicity and excellent local control rates.